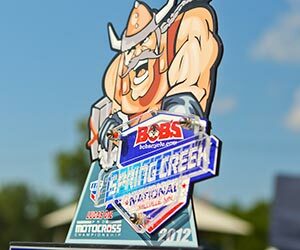 The Lucas Oil Pro Motocross Championship, sanctioned by AMA Pro Racing, made its lone visit to the Land of 10,000 Lakes on Saturday with its seventh round of the season from Spring Creek MX Park. After another dominant outing, Red Bull KTM’s Ryan Dungey took his fifth consecutive victory of the summer in front of the hometown crowd, sweeping the day’s pair of 450 Class motos. In the 250 Class, GEICO Honda’s Eli Tomac took advantage of the misfortune experienced by points leader, and Monster Energy/Pro Circuit/Kawasaki rider, Blake Baggett to claim his third win of the season. After coming out of the gate at the front portion of the field, Dungey settled into fifth place at the conclusion of the opening lap of the first 450 Class moto. As the KTM rider began to work his way forward, MotoConcepts Suzuki’s Mike Alessi assumed the lead and opened a small gap over the field. Dungey picked off one rider per lap and took over second place on Lap 3, and then set his sights on Alessi. Dungey gradually eliminated his deficit to Alessi and passed the Suzuki-mounted rider on Lap 6, quickly establishing an insurmountable advantage and taking the win. In Moto 2, Dungey wasted little time in asserting himself, capturing the holeshot and leading all 16 laps of competition. He crossed the finish line nearly 49 seconds over Alessi, in second, and celebrated with the supportive crowd. Dungey has become accustomed to winning at his home track at Spring Creek, standing atop the podium for the last five years. Today he secured his third straight victory at the facility in the 450 Class to go along with his back-to-back triumphs as a 250 Class rider during the 2008 and 2009 seasons. Alessi finished second overall (3-2) for his fifth podium in seven rounds, while Monster Energy Kawasaki’s Jake Weimer, of Rupert, Idaho, finished third (2-3). Dungey extended his lead in the 450 Class standings to 80 points over Alessi. In the 250 Class, Baggett was targeting his third consecutive overall win and got the day off to a strong start in the opening moto. After crossing the line in eighth at the conclusion of the first lap, Baggett stormed through the field, climbing his way into a four-way battle at the front of the field by Lap 5 with GEICO Honda’s Justin Barcia, Red Bull KTM’s Ken Roczen, and Tomac. The four riders paced each other for several laps, often alternating positions, but Baggett eventually moved into the lead on Lap 12, surpassing his rivals and cruising to the win. In Moto 2, Baggett once again put himself in winning position, coming out of the gate in third and passing Tomac for the lead on Lap 6. However, Baggett encountered misfortune on the following lap, losing rear traction and dropping to seventh in the running order. Tomac capitalized on Baggett’s fall and extended his lead over Barcia in second, eventually winning the moto and securing the overall. Barcia posted back-to-back runner-up efforts to finish second overall, while Baggett rebounded to finish fourth in the second moto and claim third overall (1-4). Although he missed an opportunity to gain some ground in the championship standings, Baggett still holds an 18-point lead over Barcia. 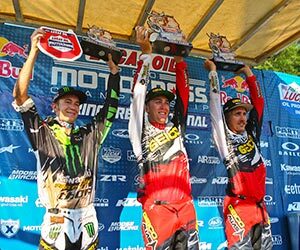 The 2012 Lucas Oil Pro Motocross Championship continues next Saturday, July 21, with round eight from Washougal MX Park in Washougal, Wash., and the Peterson CAT Washougal National. 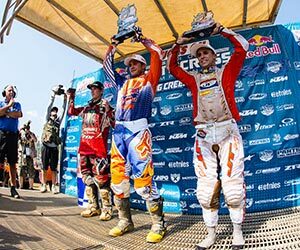 Spring Creek MX Park – Millville, Minn.
Red Bull/KTM Factory rider Ryan Dungey picked up yet another 1-1 victory in Rd. 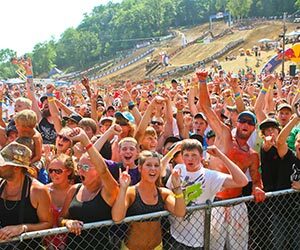 7 of the UX MX nationals 450 class to delight his home town fans at the Spring Creek Motocross Park in Millville, Mn. Factory teammates Ken Roczen of Germany finished fourth in the 250 class to remain fourth in the championship standings and Marvin Musquin of France was seventh. Dungey ripped through qualifying to register fastest qualifying but in the opening moto he got pushed wide in the first corner and dropped to eighth. He quickly made a few passes in the opening lap and was sitting in fourth position by the start of the second lap. He moved into the top three on the third lap he when passed Kyle Regal over a table top before the sand whoops. A few laps later he caught and passed both Jake Weimer and Mike Alessi to take over the lead and went on to take the race by 23 seconds. Dungey put together a perfect race in the second 450 Motocross moto. He pulled the holeshot and never looked back. He led every lap of the race to take the win by 48 seconds. This was fifth overall win of the season (from seven rounds) and improved his lead in the championship to 80 points. Roczen looked impressive in the morning qualifying on his first ever ride on this circuit where he turned the fastest qualifying time at the end of both sessions. He was off to a fine start in the first moto and was second at the first corner while teammate Musquin in a comfortable seventh. Then a mistake put Musquin back at thirteenth and left him all to do for the rest of the moto, where he eventually pulled back to seventh at the flag. Meanwhile, Roczen held on to second place for the first half of the race before dropping to fourth on the eleventh lap. He managed to stick with the front runners but could not make any more passes. Neither Roczen nor Musquin fared well at the start of the second moto and while Roczen salvaged sixth after the first corner, his French teammate was back in fifteenth. Both riders used the 30-minute plus two lap moto to move up through the order and at the half way mark Roczen was sitting in third and held on to the flag. Musquin advanced from fifteenth to sixth to be seventh at the end of the day.